See-Dub: Who won the Colorado-Texas game? In honor of this week's opponent, we grilled buffalo burgers at the tailgate! Talk about yummy! 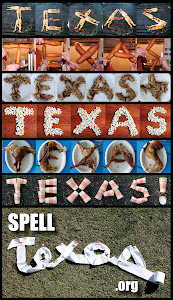 However, I cannot tell a lie: We didn't use the exotic meat to spell TEXAS. These letters are made out of plain ol' hamburger patties. As the Horns struggled mightily in the first half, I was seriously rethinking our decision to spell TEXAS using beef! Bevo burgers = no offense, apparently.